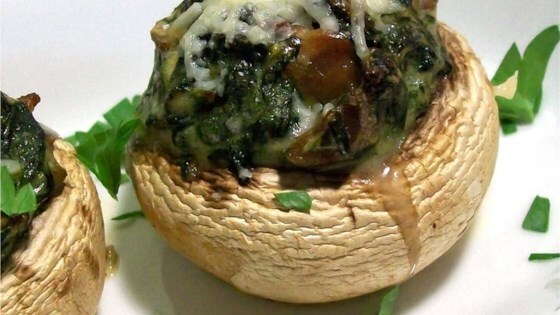 "Stuff large mushrooms with spinach, bacon and Parmesan cheese, and you have the perfect appetizer!" Preheat oven to 400 degrees F (200 degrees C). Butter a 9x13 inch baking dish with 2 tablespoons butter. Place frozen spinach in a medium saucepan with 1/4 cup water. Bring water to a boil, then reduce heat to medium and cook spinach covered 10 minutes. Uncover and stir. Remove from heat and drain. Remove stems from mushrooms. Arrange caps in the baking dish. Finely chop stems. Melt 3 tablespoons butter in a medium saucepan over medium heat, and mix in onion and garlic. Cook 5 minutes, or until tender, then mix in bacon, spinach, chopped mushroom stems and heavy cream. Bring cream to a boil. Remove from heat and mix in Parmesan cheese, salt and pepper. Stuff mushroom caps generously with the mixture. Drizzle with 2 tablespoons melted butter. Bake in the preheated oven 30 minutes until lightly browned. Good flavor but way too greasy for us. No need to drizzle the butter over the tops. If I make these again, I will definitely cut back on the butter. Served these at a wine tasting and they were gone in no time. Everyone loved them. Very easy to make. Actually made them the day before and baked them just before the party. To make it healthier, I used olive oil instead of butter and used milk instead of cream. Still very rich and delicious. I've made it a number of times for guests. This recipe was great! I ommitted the bacon and made a great vegetarian appetizer.